Unfortunately, the demo didn’t succeed. I don’t know if it was a buggy code or what but Ian Massingham, technology evangelist at AWS wasn’t able to create a supercomputer and he was as disappointed about it as I was if not more. But Ian had created one the previous evening — “Just ran up my first HPC cluster on AWS using the newly released cfncluster demo,” read Ian’s tweet from the previous day. The link to a demo video AWS sent me subsequently also showed how to get started on cfncluster in 5 minutes. Amazon cfncluster is a sample code framework, available for free – – to help users run high performance computing (HPC) clusters on AWS infrastructure. I got to hear how enterprise customers, pharmaceutical companies, scientists, engineers and researchers are build cluster computers on AWS to do some pretty serious tasks such as research on medicine, assessing financial standing of the companies etc, all while saving money (My feature article on how enterprises are exploiting public cloud capabilities for HPC will appear on ComputerWeekly site soon). And having spent the last two days at the International Supercomputing conference (ISC 2014) in Leipzig, I feel that high-performance computing, hyperscale computing and supercomputers are the fastest growing sub-set of IT. HPC is no more restricted to just science labs but even enterprises such as Rolls Royce and Pfizer are building supercomputers – to analyse jet engine compressors and to research around diseases respectively. 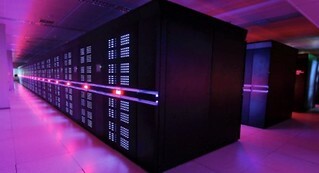 Take Tianhe-2, a supercomputer developed by China’s National University of Defense Technology for research which retained its position as the world’s biggest supercomputer. It has 3120000 cores, runs a performance of 33.86 petaflops/s (quadrillions of calculations per second) and uses 17808kW of power. Or the US DoE’s Titan – a Cray XK7 system running more than 560,000 cores or any of the UK’s top 30 supercomputers. They are all mind-boggling in their size, compute performance and uses. Whether on the cloud or on-premises, I didn’t hear a single HPC use-case in the last two days that wasn’t cool or awe-inspiring. Imperial College London, Tromso University, Norway, US Department of Energy, Edinburgh University and AWE all use supercomputers to do research and computation around things that matter to you and me. As one analyst told me, “From safer cars to shinier hair, supercomputers are used to solve real-life problems”. Now I know why Ian was having a hard time to pick his favourite cloud HPC project – they’re all cool.